We write to discover what we have become in the course of finding out who we were. is an exposition of who we are in the context of when we are living. Clio is the muse of history, in Greek tradition she is the inspiration for the writing of history. Her name means to celebrate, in the sense that history is a celebratory exercise in recalling our heritage. She is one of nine sisters who motivate humans to create the arts that each muse overseas. A narration; the exposition of important transactions in relation to facts or events. A written or oral narrative. A systematic narrative of events and circumstances relating to the human social or civic conditions.  The account of the progress of a nation, institutions, or any phase of human thought or action. 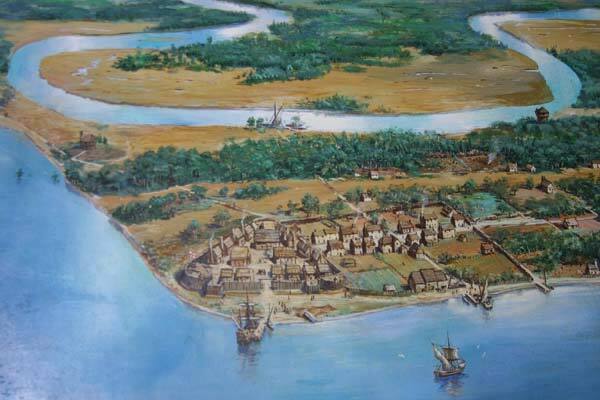 An artists conception of Jamestown, Virginia in the 1600s. a methodical narrative of events, a branch of knowledge dealing with inquiries about the distant, but recoverable, past. Something has to be older than 50 years of age [a requirement] to place a structure or building on the National Register of Historic places. A systematic inquiry into the people, ideas, & institutions that once existed, but are now changed significantly from their original design or how previous conditions of human existence pass away. ° recognition of the continuity of the human race and of our affinity with those in the past. ° remains a means by which we discover our identity through examining the origins of things, others and our derivative circumstances. An exercise in recovering meaningful evidence. It creates a commonly understood vocabulary. A practice in assembling relevant evidence in a chronological manner. An exposition of places particulars, objects, documents, or case studies in a rational contextual, and chronological framework that permits the use of judgment in making a convincing argument. The utility of history lies in our ability to organize thought chronologically to permit rational discourse about experiences as part of the common context in which people, places and things exist. A tangible measure of the transient as opposed to enduring qualities of human organization. An exposition is a comprehensive description, or complete explanation of events that develop. Because history forms the backdrop of each of our lives, no exposition is complete without the historical context in which events take place. In great measure, any history is the story we tell ourselves and others about where we are from and in our going who we are becoming as we make sense of the past which is always with us but not always apparent.